Christ’s good news demands our faithful response of mind, heart, soul and body. The unconditional love of God, shown by the most precious gift of His Son who shed His blood on the Cross for our salvation, requires a total response on our part. St. Symeon the Stylite, whose feast day is observed on the first day of the Church year, is an example of unwavering devotion. 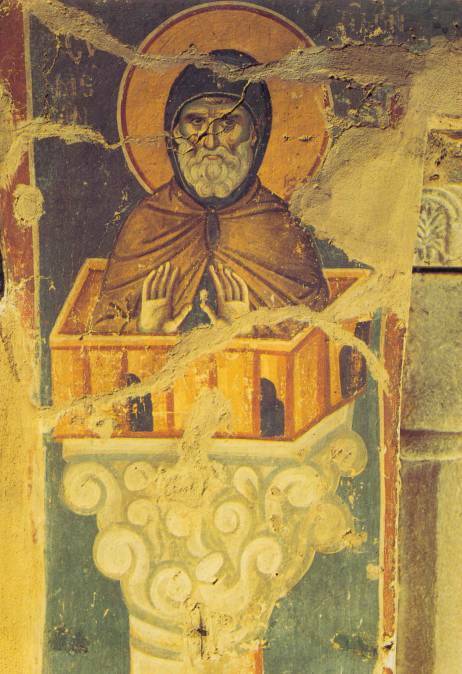 St. Symeon for many years lived on top of a pillar (stylos, therefore he is called the “stylite”) in prayer, sustained by the power of God and little else. His ascetic witness was not only a radical denial of all earthly things but also a provocative pointer to the kingdom of God. His vigil for Christ had a powerful impact upon generations of Christians in the Orthodox tradition who were moved to commit their lives to the Lord. A martyr dies once. St. Symeon was a martyr for Christ for a period of forty years until his death (d. 459 A.D.)! He ascended a cross and you a pillar. By putting before us St. Symeon’s example of extreme asceticism at the beginning of the liturgical year, the Church shows how seriously it takes the priority of Christ and how uncompromising our faith is about worldly values. From A Year of the Lord, Vol 1.